The files are now sat in my therapists office until I can deal with them again.I’ve moved four times in the last year, which was not intentional. I lived in renovations for most of that, ceilings ripped out, walls knocked down, things being taken out and put back endlessly. My health has been terrible with trips in and out of hospital. I have had moments standing on the shore staring at the sea working out what it might mean to heal. My response is no different now to how it was when I was a child. Poems are paintings of people or places that I would never recall otherwise. I am documenting my life in poetry. They are deeper than the other things that function around me. Putting words down in a certain way allowed me to breathe a little better for a while. It is not to be underestimated. I find breathing difficult. It is as if my sense of entitlement really was so far out that I didn’t always know how to do it as a wee kid. Having such an extreme upbringing means it’s a physical legacy that has stayed with me. I will inflate my lungs like a puffer fish. I’ll do it like I’m reading a manual that tells you how to do so. I’ll often be reduced to breathing through my mouth. It is my least favorite way to obtain oxygen. Whilst I rarely hyperventilate anymore—my relationship with breath and the asphyxiating, claustrophobic sensation that arises when I cannot breathe—can be temporarily cured by poetry. It has a very particular way of filtering out the toxic. It turns moments into little films. Snapshots are taken in words. Poems are paintings of people or places that I would never recall otherwise. I am documenting my life in poetry. They are deeper than the other things that function around me. Without the descent I do not know how I would have risen back to the surface sometimes. The Panopticon will be adapted for the stage by Jenni Fagan from her celebrated novel of the same name. A gritty and gripping coming-of-age tale turned on its head, the production will be directed by Debbie Hannan, November 2019, touring to Traverse Theatre, Edinburgh & Platform, Glasgow. When the circumstances of its writing and the intent of its author align just so, a poem can reveal the structures, and especially the ironies and artifices, of the historical discourses in which it’s embedded. Jenni Fagan’s second collection, There’s a Witch in the Word Machine, makes no secret of its designs to do the same. Now, the political and cultural urgency of a collection that is dedicated for all the witches and that sets out quite explicitly to explore words ‘as spells, incantations, curse and solace’ might not seem obvious. But, the opening poem, which shares the collection’s title, makes the radical proposition at the heart of this volume clear. The titular witch casts spells from within the machine: ‘dots, particles, atoms / elemental, bodiless’ are her resource; ‘argot, idiom, double-grave, slash-through’ are her grammatical tools (sometimes weapons); ‘to crash the programme, / rewrite it as it should have / been’ is her desire. However, the poetic voice states quite unambiguously that this isn’t a matter of ‘thaumaturgy’ (conjuring, or the material ‘work’ of magic). Rather, these are spells ‘only’. The result is that Fagan doesn’t get caught up in the leaden debates over poets as ‘legislators of the world’, as Shelley had it; or poetry making ‘nothing happen’, as Auden did. Instead, poetry is conceived as a subversive approach to language that just might break the ‘word machine’ of established discourse and reconstitute it in more inclusive and emancipatory forms. In the graphics on the cover, and the terms of the opening poem, the ‘word machine’ might be pictured as a vast typewriter, or ‘typing shell’. A mechanical host to the cold inheritance of the Enlightenment – the language of reason and logic; and to the reproduction of powerful narratives that assimilate or erase the lives of those it can’t and won’t herald (not a million miles away from the literal and figurative panopticon of Fagan’s debut novel). Or, it might be where saboteur witches and their spells will find their audiences, reaching out from small, claustrophobic experiences to find their resonant frequency – that pitch and hum that carries them to those who need to hear them. This is the through-line that connects a host of voices helpfully summarised in a further dedication in the acknowledgments: ‘To the lovelorn and the loveless, to the loved and the insecure, to the bored and the crazy, to the desperate and terrified, to the hopeful, to the brave, to all of you’. That quiet call is refigured throughout There’s a Witch in the Word Machine, often with a devastating simplicity. ‘Spell Written in a Square’ is a twelve-word, one sentence poem describing the pain of living that has, coded into its line arrangement, a small corrective – a cause for hope. ‘You Know’ hits like it’s the one hundred per cent proof distillation of a long line of pop classics: from the post-war standard ‘You Always Hurt the One You Love’, through Culture Club’s ‘Do You Really Want to Hurt Me?’. But its compassionate clarity is breathtaking. This sustained effort to give voice to gestures of strength-in-vulnerability, kindness, and solidarity, is not wholly taken up with heartbreak, however. In pieces like ‘O.C.D.’, form and content swallow one another’s tails with hilarious abandon: ‘the brain fucks itself / in circles’. The literal centrepiece of the collection is an extended poem titled ‘Bangour Village Hospital’. Switching back and forth between open and closed unrhymed couplets, like much of Fagan’s poetry, this piece leaves space for its poetic voice to develop. Almost every clause of every sentence hangs in the air like smoke before the next exhalation disturbs it. And in this poem in particular, that pacing is vital, as the infants who were born, lived, and died in this institution in West Lothian haunt it, from the early years of the last century to the present. These ‘refugees from reality’, these ‘life escapees’, produce a kind of impressionistic social history wholly fixed in place and shot through with a yearning for rest and silence. In a sense, it reads like a war poem, examining how history’s losses might be redeemed, and our guilt expiated, if only we’d learn. ‘Responding to Life in a Secret Squirrel Universe’ and ‘Death in Sednaya’, which face one another very near the end of the collection, capture Fagan’s mastery of diverse approaches to persistent themes in There’s a Witch in the Word Machine. The first, with its wry title, stakes out the ‘value’ we must place ‘on existence / and goodness’ in the face of an infinite and unfathomable universe. Whereas the second describes the moments before the execution of a child under Bashar al-Assad’s bloodthirsty regime: his ears, eyes, fingers, feet, and his memories catalogue the love he’s given and received in his short life. The collection’s exploration of words as ‘spells, incantations, curse and solace’ seem to sit comfortably over the project of poetry more broadly – to take language away from the instrumentalism it suffers in other contexts toward more free and associative usages. The prevalence of the one-word line in this collection speaks to that project, too. In a cultural and political discourse given shape by algorithms and tweets, it seems appropriate to rekindle other formulations that don’t function with that prerogative to reproduce systems of power and exploitation. That’s what I think the ‘spell’ looks to do in Fagan’s hands. Though the witch of the title gives it a particular inflection, it’s one of those words whose definitions and uses are so diverse, that it can speak to the paradox of power and vulnerability that comes with organising words and giving them over to the world. [Humanity’s] self-alienation has reached such a degree that it can experience its own destruction as aesthetic pleasure of the first order. This is the situation of politics which Fascism is rendering aesthetic. Communism responds by politicizing art. If the ‘word machine’ and the resurgence of Fascism have the same effect in the twenty-first century, Fagan’s saboteur witch doesn’t waste time with recouping a lost ‘authenticity’. She works to ‘crash the programme’ and ‘rewrite it as it should have / been’ by making space for us all – by politicizing art even at its most intimate. It is wild and destructive, tentative and provisional work. 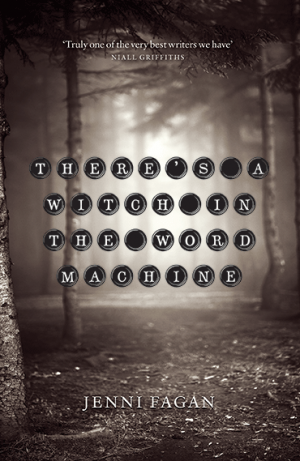 There’s a Witch in the Word Machine by Jenni Fagan is published by Birlinn, 2018.